Earn up to 3,200 reward points. A simple, easy-to-use 1x15" combo ideal for small gigs and rehearsals. The Eden E Series offeres Eden tone and features in a more affordable package. Lighter weight and user-friendly features, combined with high power and killer tone make the E Series the perfect choice for intermediate players, semi-professionals, even touring pros who appreciate a great value. 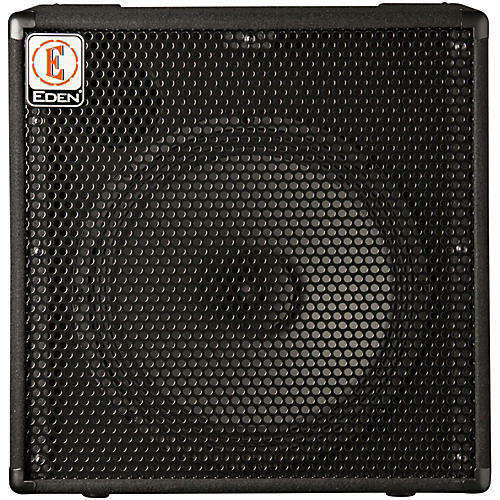 The Eden E-Series 180W amplifier provides enough volume for the more serious rehearsal or small jam session. The cabinet design keeps size and weight to a minimum without sacrificing tone! As well as more power, all of these amplifiers offer an increased feature set, which introduces the musician to the staple tone controls and additional functionality you might find on more serious bass amplifiers on the market. There is even a balanced XLR output so that any of these combos can be used in conjunction with a desk console and/or PA system to provide the ability to use the amplifier in a live music environment or through other equipment to record your bass lines. Dimensions: 20" x 20.7" x 14.5"